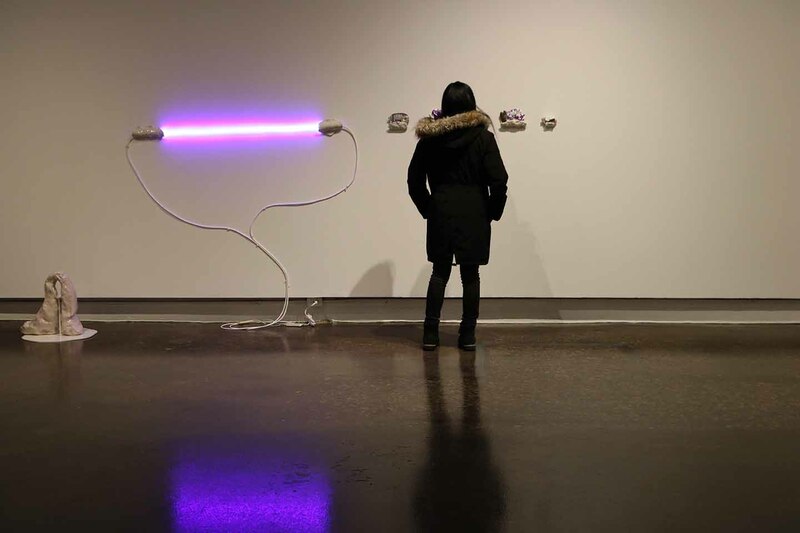 Contrasting works of contemporary art are presented side-by-side at the University of Waterloo Art Gallery (UWAG). With one half featuring glazed blobs of porcelain, a hat stand sculpture, and advertisements with Tom Selleck; the other half displays seemingly ordinary dentistry chairs that may be anything but. It is an intersection of hats, dentistry, and art. On Nov. 15 the exhibition tour brought together artists Katie Bethune-Leamen and Catherine Telford-Keogh to discuss their collections, Orchid mantis. Tom Selleck. Hats. (Gold-hatted, high-bouncing lover.) Also hats. and Dental Dam respectively. Both work with fabricators who are individuals that specialize in their trade, such as upholsterers and metal welders, to augment their art. Walking into the gallery, Bethune-Leamen’s hanging wall piece featuring a rainbow tunnel titled, A billboard poster for 1980 French release of ‘Holy Mount’ in a decidedly brown-glazed porcelain frame immediately captures the visitor’s attention. Bethune-Leamen describes her style as a “hand-material sensibility that is both [controlled yet loose]”. Her artwork is accompanied by narrative titles and primarily consists of indistinct forms of porcelain glazed in various colours alongside vivid neon lights. She is interested in how things function spatially and change in relation to how individuals experience and view the piece at different angles. She enjoys exploring a realm where things lack definition. “When something has a moment that isn’t clear, for me, that’s where I as a viewer have an ability to have more of a relation with [it],” Bethune-Leamen said. Likewise, she expresses that certain horror movies may be so gripping due to the presence of something undefined as it is where the magic and power resides. She enjoys discovering the unknown, but not when viewers are required to understand a reference to experience the art. A recurring object is hats, as seen in her piece Hat stand/Maypole/Qunagle Wangle’s hat/Jodorowsky’s hat, a hat stand skewered by porcelain blobs. To Bethune-Leamen, hats represent an extension of self as statements of a person. For UWAG, she was able to create taller pieces such as this one to fit with the higher ceilings. On the other hand, Telford-Keogh enjoys working with live art, materials like food and liquids that change over time. While challenges include materials degrading and reacting with other substances, producing work that may be unstable and difficult to transport, she finds the process all the more exciting. Inspired by a drooling bulldog to explore mouths and bodily functions, which gave rise to Dental Dam. Telford-Keogh seeks to dissect the associations of institutional spaces and trademarks in a capitalist society. “Eating and digestion is a process about blurring boundaries by taking something into yourself,” Telford-Keogh said. As a result, off-white dental chairs fashioned from repurposed gamer chairs found on Kijiji and from Value Village, trays of Bio-Pure liquid that digest organic matter, and Vitaminwater in an airtight container hung on the wall are only a couple of the unconventional artworks at her exhibit. She also experimented with branding names, their fonts, and the way in which they communicate ideas or tones as she works with language like she works with materials, really putting thought and detail behind each facet of the exhibit. However, both artists express in a similar vein that their art encourages different perceptions of things in relation to where one may be viewing their work. It leads to an expression of self in relation to the world surrounding them. “My hope is always that there’s a space being created for viewers to engage in a conversation that … is one about what it is to be [in the world],” Bethune-Leamen said. Both exhibitions will be on display at UWAG until Dec. 15.